I’m writing about powdery mildew again this year because again it has invaded my summer squash plants. What a pain in the patootie! I’ve learned something new this year, but please also refer to last year’s pretty thorough post Powdery Mildew if you’re having the same problem. 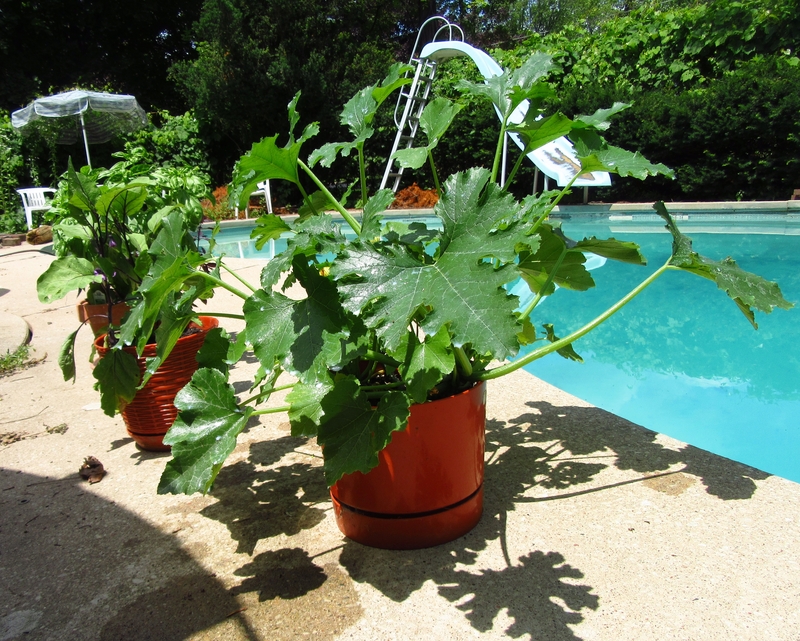 This year’s summer squash sprayed with 1:1 milk/water solution to smother powdery mildew. Because I treated the plants right away with the solution, my plants look so much healthier than they did last year. Powdery mildew affects a variety of flowers and forbs and trees and shrubs. My Monarda was again hit hard along with my Virginia Waterleaf. In my research I ran across an article by Beth Botts of the Morton Arboretum who suggested thinning out plants to improve air circulation. 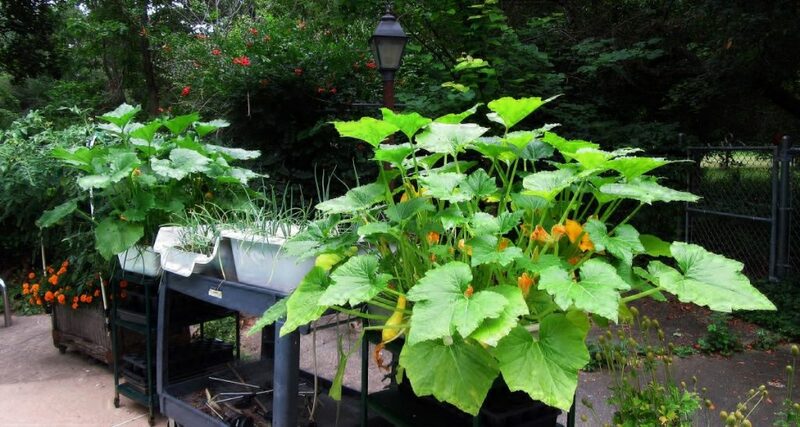 I’m not certain how I would do that with summer squash, but it would likely work on shrubs and trees (lilacs, ninebark, catalpa, dogwood and viburnum are prone to powdery mildew). She also suggested disposing of any diseased stems and leaves in the landfill instead of landscape waste — a point that cannot be emphasized enough! I always thought powdery mildew was the reason the little squashes on my plants withered and died. But in my research this year I ran across an article that said if the pollen from the male flowers don’t get into the blossoms of the female flowers, the squash won’t mature. The little squash will shrivel up and die. Apparently, each female flower’s ovary at the base of the bloom grows, but if it is not pollinated in a timely manner, when it gets to be about 2 to 2-1/2″ long, it will wither and die. The ovary with its stigma at the base of the blossom is how you would distinguish the female from male blooms. Male blossoms have a single stamen in the center of the bloom. You can use a cotton swab to remove some pollen from the anther to transfer to the stigma in the female blossom. Or you could actually remove the male blossom and smother it against the female blossom to transfer the pollen. Since the male blossoms fall off right away, there is no big loss. And instead of discarding them, you can fry the battered blossoms for a special treat or add them to a salad. Another distinguishing characteristic between the two blossoms is that the female flowers grow on a short stem, while the male flowers grow on a long slender stem. Late summer hot, humid days are the perfect time for powdery mildew to fly in and do its thing, so get your milk solution ready and spray right away to keep your summer squash producing. 1:1 ratio. SFGate Homeguides has some excellent information about summer squash. Be sure to read the related articles. Thanks… I will cut out the leaves of a plant that has this this week-end! Roger — One thing she didn’t mention in the article is to clean your tools after cutting away affected debris. It might be overkill, but it wouldn’t hurt to clean the tool before using it again on an unaffected plant.